Throughout the year, we'll be running a series of interviews with artists whose work we find inspirational. Mia Christopher is a multimedia abstract painter who's been with Giant Sparrows since we started out. We caught up with her and chatted with her about her artwork, the materials she uses, and making artwork in unlikely places, like the waiting room at the DMV . 1. Could you tell us a bit about yourself, and what you do? I am a multi-disciplinary artist currently living and working in San Francisco, California. I graduated with a BFA in Painting from California College of the Arts in 2012 and have been exhibiting works locally and internationally since 2008. My work varies in scale and medium, from tiny paintings with nail polish on marble bits, to latex sculpture, to large scale mixed media paintings on canvas, with themes often rooted in inquisition, obsession, mark making and indulgence. One of Mia's sketchbook pages from her Flickr. I am inspired by so many things and people. But a short list off the top of my head would be: Jenny Holzer, Tantric painting, Rineke Dijkstra, and Kiki Smith. 3. You use a lot of multimedia elements in your work; but what three materials could you not live without? Iridescent enamel, Stonehenge fawn paper, and gel pens. 4. What does being an artist mean to you? Is the idea of creative freedom important in your artwork? When I am making my own work I am not answering to anyone or working to produce anything other that what interests me. There is no second guessing about my choices and an understanding within myself that this practice is a lifelong experience. Doing design or illustration work is different because there is another party involved that needs to approve what you are doing. This can be challenging and lead to interesting discoveries. It can also be frustrating and difficult. I think it's fruitful to experience both ways of art making. 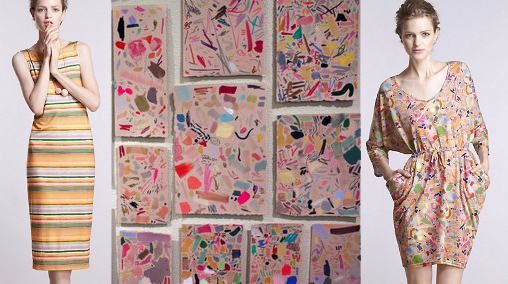 In 2012, Anthropologie turned some of Mia's Test sheets into Textiles for a line of dresses. 5. What does it feel like to see one of your paintings applied to a finished product, like your dress collection for Anthropologie, or one of our Phone Cases? When some of my paintings were appropriated into textile patterns for a dress line with Anthropologie in 2012, it was really exciting to see the marks blown up and moving on soft cotton around bodies. I have done some hand painted textile work on chiffon and enjoy painting on a variety of materials. Digitally printing analog works onto commodities like textiles to be made into clothing or hard shell cell phone cases is interesting to me because it creates a new context and new life for that artwork. I can make something at my desk or in my studio or on a train or in my sketchbook in the DMV waiting area, and potentially turn that drawing into something else entirely, that will be used by someone I don't know and become a part of their every day routine. There is a mystery in that that is exciting to me. 6. Your "Scribbles" design is one of the most popular designs that we sell, and has been with us since we launched. Why do you think it's such a popular design, and would you pick it as your favourite? Well, it's a very convenient phone case to have because if it ever gets dirty no one will be the wiser! I've definitely spilled paint and nail polish on mine before and it blends right it, which is neat. I think that people like the rhythmic chaos in that particular painting. The colors are appealing, maybe a bit cheerful. There is a lot to look at on it, and I think people like being able to go back and see new things within the painting, or dreamily make up stories. I think my favorite of the three on Giant Sparrows is the one titled "Test Sheet," because it has more painterly moments and I like the textures that show up, though "Scribbles" has more, and tinier, marks. All of Mia's Phone Case designs are available here, on our website.